Rectangular plaque secured by 4 screws to the wall. At the top is the family crest (lion's head crowned and charged with a fess dancettee Ermine) and motto (Ne cede malis) and at the bottom the badge of Royal Navy. IN THANKFULNESS TO GOD/ AND EVER LOVING REMEMBRANCE OF/ IVON GORDON FELLOWES/ MIDSHIPMAN ROYAL NAVY/ YOUNGEST SON OF REAR ADMIRAL/ SIR THOMAS H.B. 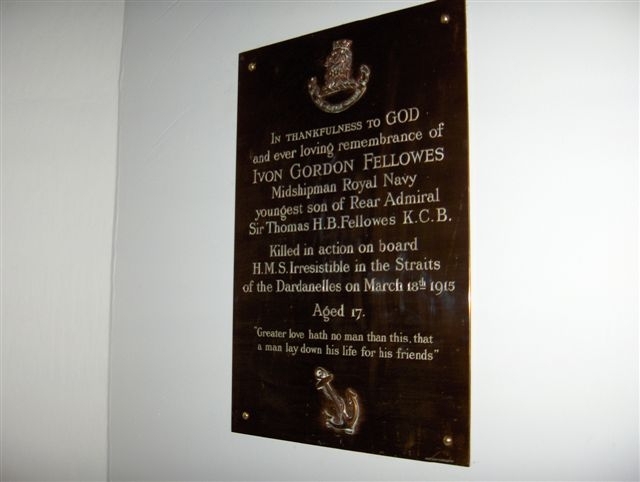 FELLOWES K.C.B./ KILLED IN ACTION ON BOARD/ H.M.S. IRRESISTIBLE IN THE STRAITS/ OF THE DARDANELLES ON MARCH 18TH 1915/ AGED 17./ "GREATER LOVE HATH NO MAN THAN THIS THAT A MAN LAY DOWN HIS LIFE FOR HIS FRIENDS"